There have been many JRPGs released over the past five years, and many of them are great. Only one can be safely labeled the best. 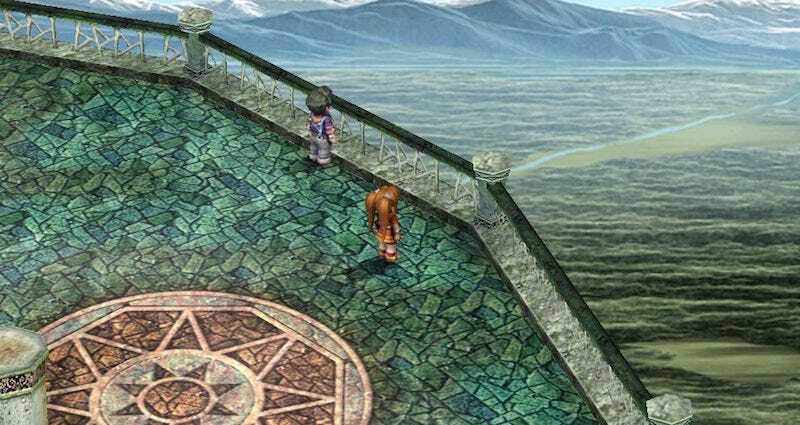 Said JRPG is called Legend of Heroes: Trails in the Sky, and despite the awfully generic title, it’s a stellar game, one that calls back to SNES and PS1 classics but ditches the obsolete nuisances that marred those games. Like other recent games inspired by the 90s—Shovel Knight, Pillars of Eternity, etc.—Trails in the Sky plays less like an old-school game and more like how we remember an old-school game, full of life and joy and charm. There are no random encounters; all enemies are visible on the battlefield before you attack them. You can flee from every non-boss battle with an 100% success rating—the developers at Falcom knew that putting a random number generator on escaping combat would be a serious waste of time, so they didn’t bother. Trails is full of player-friendly tweaks like that: If you die in a battle, for example, you won’t lose much progress, because you can start again right from the top without missing a beat. What makes it so great, then? For starters, there’s the soundtrack. Now That’s What I Call Combat Music™. The battle system is quite good, reminiscent of Grandia in that it’s turn-based, but both your turn order and battlefield positioning play important roles in the outcome of every fight. You’ll see a large stack of portraits in the top left corner representing when each of your allies and opponents will take their turns. To beat challenging bosses, you can use this to your advantage by casting spells that delay opponents and speed up your friends. Trails in the Sky’s biggest selling point is that it’s a game for people who like to read. It’s a game for anyone who wants to dig into a brand new world and just explore, talking to every NPC and checking every hidden corner for secrets. Nearly every character in Trails, from shopkeepers to guardsmen, has a unique name and personality, and often they have their own little stories, too; keep talking to them between every plot point and you might see them fall in love with one another, or get married, or go traveling to other cities where you can find them and chat with them more. Unlike many video games, the dialogue in Trails feels like a reward rather than a chore, especially when you’re investigating mysteries and solving unusual side quests. One optional mission in SC, for example, features a wife who asks you to beat her husband at poker so he’ll stop gambling so much. Another tasks you with investigating the mystery behind which member of a political campaign hit another in the back of the head. Both the main story and side quests unravel in delightful, twisty ways. Like the PlayStation versions of Lunar: Silver Star and Lunar: Eternal Blue, Trails in the Sky is full of personality. The writing is generally excellent, and it’s really fun to watch the main character, a spunky warrior named Estelle, evolve from a peppy, somewhat spoiled brat to a badass, mature woman who can hold her own in just about any fight. The story starts off with her going off on a quest to hunt down her father, but it expands into much, much more. It’s a slow burn—and you have to know that if you start playing Trails, you’re committing to at least 100 hours worth of a meaty RPG—but it’s worth it. It’s been a solid decade for JRPGs so far, don’t get me wrong. Other contenders for Best of the Decade include Ni no Kuni, Bravely Default, Radiant Historia, and The Last Story. Trails in the Sky beats them all.